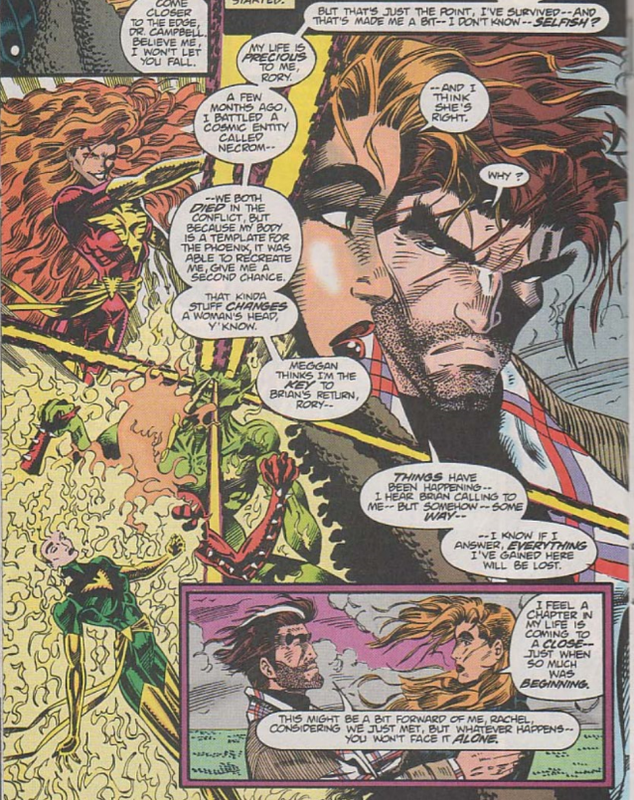 Phoenix finds herself being pulled into the future by Captain Britain. 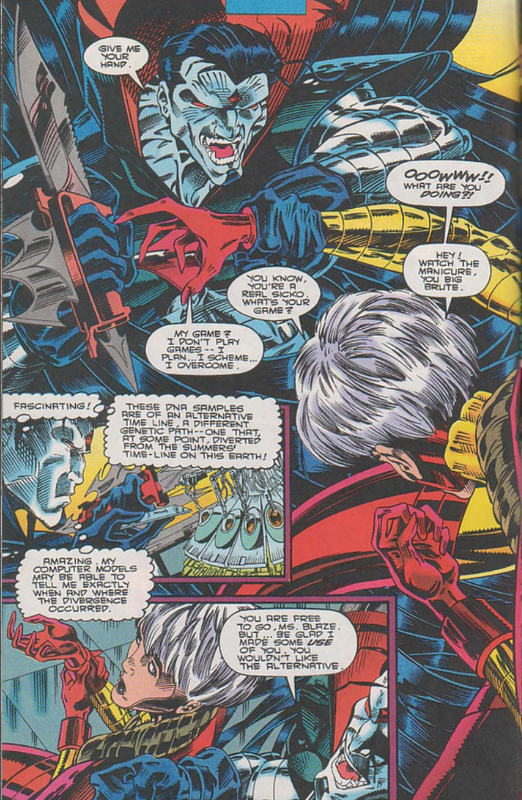 Captain Britain suddenly appears before Phoenix, and she feels herself being pulled into her future as a result, causing her to break the connection. This act of self-preservation proceeds to fill her with guilt as she sees the sad condition Meggan in is, as Moira & Rory Campbell examine her. 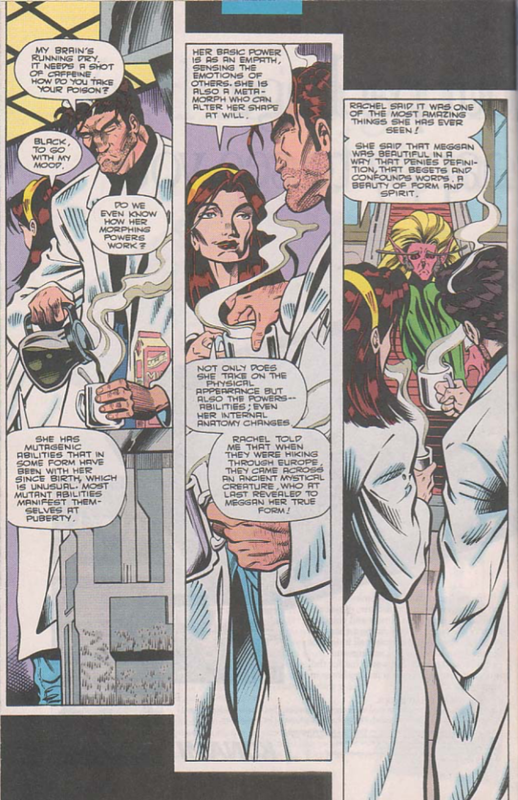 Meanwhile, Nightcrawler checks on the captive Spoor, and later, Rory tries to get Rachel to open up about her guilt. 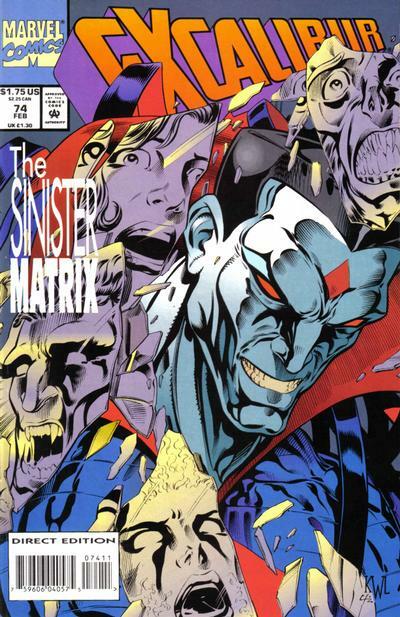 Elsewhere, Mr. Sinister meets with Gamesmaster & Siena Blaze, and his anger at the latter's failure to retrieve Proteus' DNA is lessened when he discovers Blaze scratched Phoenix, thus providing Sinister with Rachel Summers' DNA. Back on Muir Island, Nightcrawler ponders his heritage while missing Cerise, and Kitty finally decides to unpack following her move to the island. The next morning, Moira checks on Meggan and finds her in a feral state. When Excalibur intervenes, Meggan attacks Phoenix, crying out for her to help free Captain Britain. Just then, Rory is able to dose Meggan with a sedative, knocking her out, prompting an angry Phoenix to tell Rory he had no right to jump in on her behalf. As of this issue, Rachel is no longer manifesting random body parts of Captain Britain, but is periodically pulling him out of the timestream, at the same time that she herself feels as though she is being pulled forward in time, all of which will be resolved next issue. 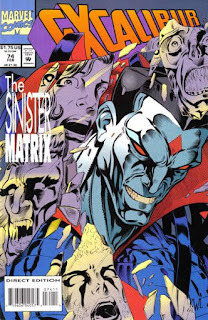 Mr. Sinister, continuing his "pop up in a random issue, act mysterious, then disappear" '93 tour, pops up in this issue, having been the individual who tasked Gamesmaster with acquiring the DNA information of Proteus from Muir Island. His dismay at Siena Blaze's ultimate failure in that matter is sated when he learns she scratched Phoenix while fighting her, allowing Sinister to get a sample of Rachel Summer's blood. A subtle Rory-is-Ahab hint comes when Rachel details her past to him, and his image is juxtaposed with Ahab's. In a setup for the upcoming X-Men Unlimited #4, Nightcrawler references Mystique taunting him about his heritage all the way back in X-Men #142, something that hasn't really been referenced since X-Men #177 and thus seems like a way to remind readers of this dangling plotline ahead of the upcoming story. There's no letters page in this issue, but the Statement of Ownership still needs to be printed, so it gets wedged into the extra-wide margins of the last page, something I don't think I've ever seen before. Ian Churchill, still on the verge of his big breakout, pencils this issue, with the end result bridging the gap between his more cartoony work in the backup story of the most recent X-Factor annual and the more familiar "Jim Lee-esque" style he'll become known for, while also looking a bit messy and inconsistent at times (likely due to the multiple inkers and, presumably, time-crunch brought on by deadlines). A narrative caption misspells Kitty's last name as "Pride". During her analysis of Meggan, Moira notes that Meggan has both empathic and metamorphic abilities, but attributes both to being mutant powers (and not a result of her specific biology, as in the past). She also notes how Meggan's abilities manifested themselves at birth, unlike most mutants. 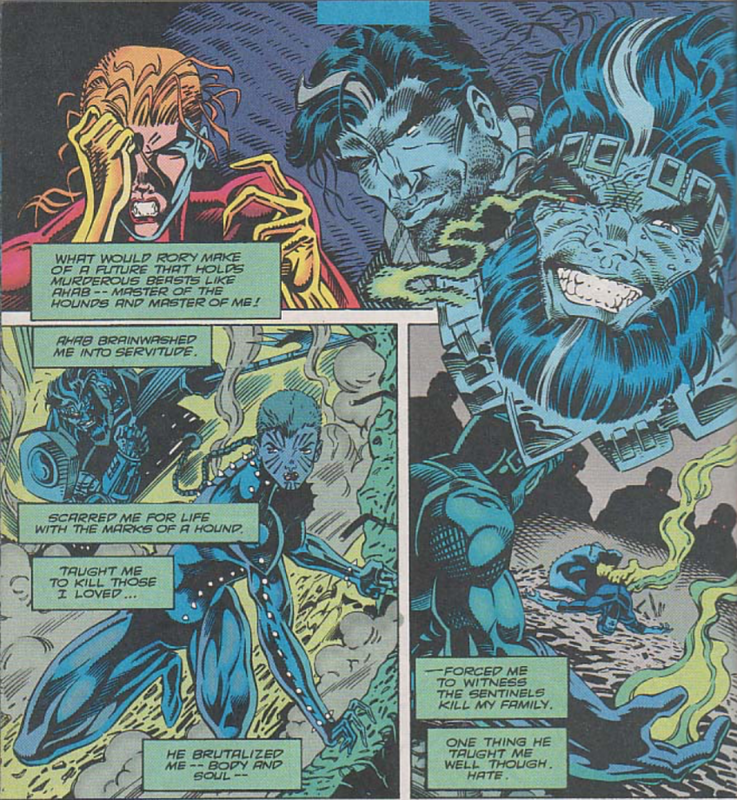 Meggan & Phoenix' encounter with one of the primate-like Neuri is also referenced, but no footnote is given (it was in issue #46). Phoenix tells Rory about her encounter and near-death at the ends of Necrom, something this Alan Davis-ignorant reader (back when I first read this issue) appreciated as a glimpse into the series' history (though it too goes unfootnoted). 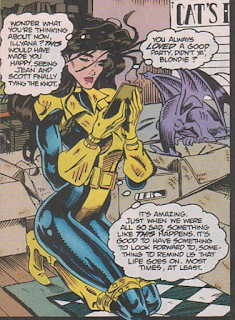 In a clunky bit of writing (likely intended to once again tease the upcoming wedding), Kitty, still mourning Illyana's death, says Illyana would have been happy to see Scott & Jean getting married, despite the fact that Illyana never really knew Scott & Jean as a couple: she didn't come to America (as a child) until after "Jean" died, and Jean was off the board (either hibernating in Jamaica Bay or exiled away from the X-Men & New Mutants in X-Factor) for the duration of Illyana's time as a teenager (Illyana reverted to her childhood state during "Inferno", the same time the X-Men learned Jean was alive, and was returned to her family in Russia by the New Mutants before they briefly became wards of X-Factor). 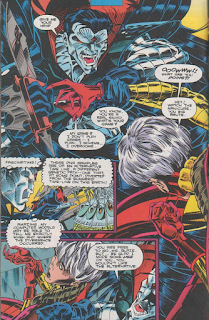 So Illyana knew Jean, at best, as a revered figure amongst the X-Men; if anything, she'd probably be wondering why Cyclops wasn't still married to Madelyne (whom she did know), and that's assuming the 7-years-old-ish Illyana who died even remembered anything of her time as a teenager (which I believe she was meant not to). 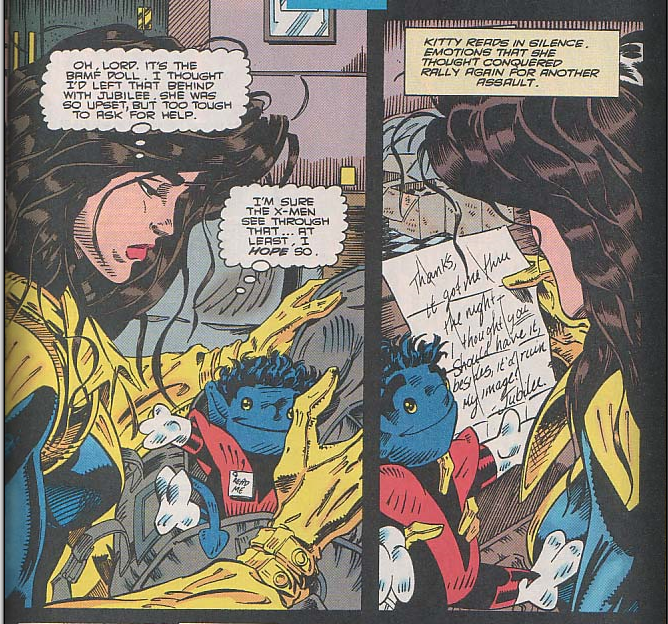 In a sweet moment, when Kitty finally gets around to unpacking, she discovers that Jubilee gave her Illyana's Bamf doll. 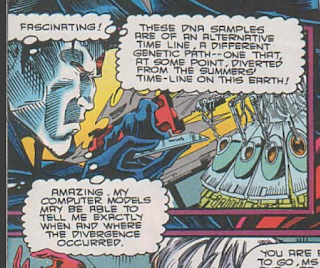 Mr. Sinister's computer analyzes Rachel's DNA super quickly. Rachel, musing to herself, references "just the facts, ma'am", a line of dialogue often misattributed to Det. Joe Friday from Dragnet (much like "Beam me up, Scotty", he never actually delivered that specific line on the show; rather, it entered the pop culture zeitgeist via a parody), which seems like an odd reference for a character who grew up in a dystopic future and probably hasn't much of a chance (or inclination) to check out Nick at Nite reruns since arriving in the past to make. 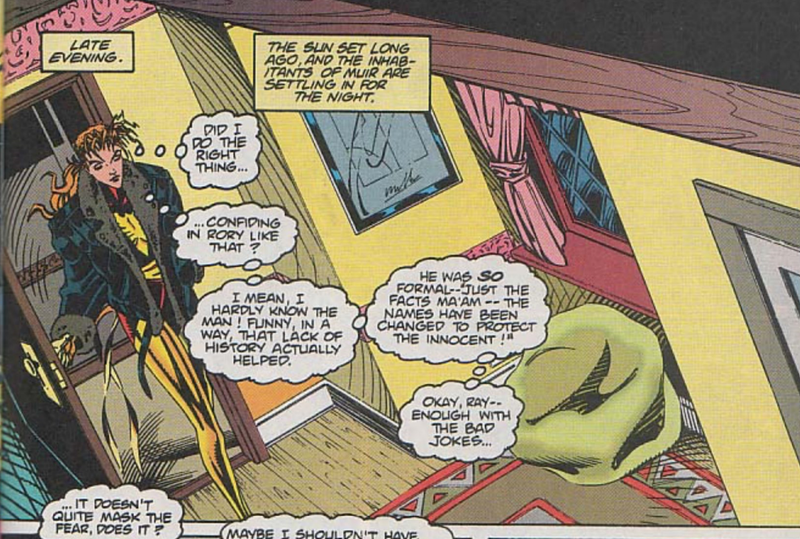 Nightcrawler is seen briefly pining for Cerise, in what was likely my first encounter with the character (outside of trading cards) back in the day. While the plots of this last few issues have been fine, mixing some standard "new direction" material with an unfortunate Upstarts appearance, Richard Ashford's scripting has never been great, and for whatever reason, it stuck out as being particularly bad in this issue. Nearly everybody speaks in exactly the same voice, with the exceptions of Moira & Rory (who have the "benefit" of having a phonetic Scottish accent to help distinguish their dialogue) and Siena Blaze (who gets some vague Valley Girl-ish dialect). Kitty, Phoenix & Nightcrawler - the ostensible stars of the series - all more or less sound the same, with the former two acting wildly out of character in the process. Kitty, while going through a lot at the moment (between the death of Illyana & the defection of Colossus), is uncharacteristically morose, collapsing into histrionics as Moira attempts to help Meggan (and also wildly mischaracterizing what Illyana's theoretical reaction to the upcoming wedding would be), while Phoenix is suddenly scared enough of her home timeline that she's refusing to help Captain Britain (a fear that, while justified, comes out of nowhere this issue), and dropping references to an old TV show with which the character has no established reason for possibly being familiar. It's good to see Meggan & Captain Britain, two of the team's founding members, being brought back into the fold after their rather unceremonious departures, and a Mr. Sinister appearance is always appreciated, but neither is enough to overcome the significant deficiencies in the series' already not-great scripting on display in this issue. Next week: another batch of X-Men & X-Force action figures, and Cable #8. Checking out Nick at night is literally almost the first thing Rachel did upon arriving to the past. Alas, Selen. Is this the first time that Sinister’s hair is depicted as actual hair, instead of a Colossus-esque metal head as always? I believe so. Though we'll see something similar in his "Age of Apocalypse" incarnation as well. I didn't read EXCALIBUR at this point, but if I had, I would've loved Churchill's artwork. But nowadays I think most of it looks awful. Ken Lashley's cover, on the other hand, looked great to me in my teens (I had a pinup of it from an X-Men poster book) and still looks great now. I have a similar love/hate thing with Churchill's art. I loved it back then, but its flaws are much more glaring now. I suppose Rachel could’ve picked up the catchphrase as part of 20th-century vernacular, without ever knowing (or having seen, at least) its source, but such generally abysmal work hardly merits a save. The bit with the doll is nice, yeah. Otherwise, I’m thisclose to pining for a fill-in from the Cross-Time Caper days. Yeah, this gets better, even before Warren Ellis shows up, but that's still clearing a pretty low bar.